As Americans awoke to celebrate Independence Day, a lone Soviet fighter jet took off from Poland and began flying west. The pilot of the MiG-23 “Flogger” did not explain himself as he soared across Europe. Crossing Polish airspace into East Germany, attempts to radio the pilot were met with silence. As it continued westward, NATO became increasingly concerned by the potential threat. Tension reached a tipping point when the fighter crossed into West Germany. The US scrambled the “wolfhounds”, a fighter squadron based in Holland. Two F-15s were dispatched to intercept, armed for a dogfight. But when the American pilots caught up with the MiG, they were astonished. The cockpit was empty. There wasn’t even a canopy. Confused, the Americans tailed the aircraft for a few minutes. They were instructed to shoot it down over the North Sea, but it didn’t make it that far. 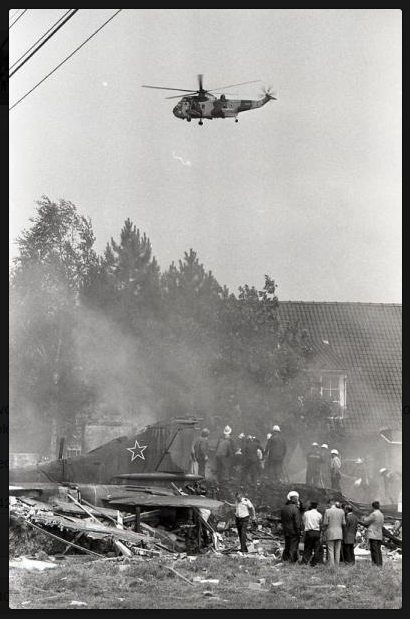 Almost in France, the MiG crashed into a Dutch town called Kortrijk, the “city of golden spurs” just short of the border, destroying a house and killing a teenager inside. I discovered this tale while clicking down a rabbit hole of “related articles” on Wikipedia. I’ve no idea how I ended up there, but the story has notable significance today, for reasons we’ll come to shortly. An hour and 560 miles earlier, the pilot of the MiG, one Colonel Skuridin, had ejected during takeoff. A problem with the afterburner made it seem like the engine was failing just 500 feet off the ground – but after his ejection the plane corrected itself and had carried on west on autopilot. This autonomous joyride from decades past has an unexpected partner today. Since the Great Recession a decade ago (“great” if you were a short seller, not so great for everybody else), major central banks set about “reflating” the world with ultra-low and negative interest rates, and printing money to buy assets. Their responses to the recession were unconventional – but as so many of them were doing similar things, it was assumed they were co-operating. Investors took comfort from the idea that central bankers had got together and were co-ordinating a global recovery programme. In other words, it seemed as though the global economy had a pilot. The central bankers were getting together and flying the entire world away from the turbulence and towards a smooth landing. But just like in 1989, the assumption that somebody is flying this plane is incorrect. William White, the consummate central bank insider, recently revealed that there’s nobody in the cockpit. White has worked extensively within the plumbing of the financial system at the Bank of England, the Bank of Canada, the OECD (Organisation for Economic Co-operation and Development) and the central banker’s central bank, the BIS (Bank for International Settlements). White warned of the systemic risks building in the financial system years before 2008, and was recently interviewed by Grant Williams (as an aside, I recently had Grant on The Gold Podcast – it’s one of the best we’ve done so far. If you’ve not listened to it yet, I highly recommend you do). Grant Williams: It’s interesting because I think a lot of people have taken comfort that there’s been a coordinated central impulse. I’ve heard a lot of people talk about, well, at some point, it’s going to be every central bank for themselves. And that’s when the problems will start, when the coordination aspect goes away. But if that was accidental, at best? …I think there have been elements of coordination. I mean, I remember I think in 2008 at one point the Swiss National Bank and the Bank of Canada and a bunch of others announced at the same time that they were all lowering rates. But for the big guys, I think the focus is resolutely on domestic issues. Domestic issues. Not global ones. It’s every nation for itself. Should one country run out of fuel, the rest of the world may not offer help. White has gone on the record to say that the financial system is riskier than it was in 2008. And as much as the idea may have reassured investors, there’s nobody flying this plane. Let’s hope we have enough fuel. And that we don’t get shot down for that matter. I recommend you pack a parachute, in any case.